After the great success that was my Borders signing in October which later saw the administrators being called in and me not being paid (so far) for the stock I sold for them, I will be appearing in the Berkhamsted branch of Waterstone's this Tuesday between 10 AM and 4 PM signing copies of Book of Lists. I'm hoping to sell lots of copies to panicking last minute Christmas shoppers. I haven't been able to promote this signing at all so if you're in the area please pop by and say hello. I will appreciate the moral support. 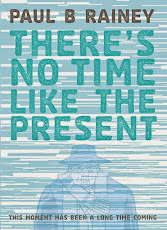 Richard Bruton writes a review of There's No Time Like The Present part 10 for the Forbidden Planet blog. "To be honest to start reading this mind bending time travel saga at issue 10 would just be foolish. However, to sit down and read the whole thing in one go, all 10 issues is definitely worthwhile – it’s a great, complicated read – mixing equal parts time travel mystery with an emotional, sentimental tale of older folk – completely original stuff – but not something to dip into at this point. You really do need to get all the issues so far to really appreciate the story." The good news for you is that all ten parts so far are still available from The Shop. Many thanks to Noel Curry for pointing me in the direction of this Book of Lists review on The Roomyverse. "The Book of Lists is pbrainey’s voice, and it’s a good ‘un." There is, of course, much more here. Richard Bruton also reviewed the BASTARDS anthology yesterday on the Forbidden Planet Blog to which I, along with many other from the self-press comics scene, have contributed strips to. "A real call to arms for the UK scene, proving yet again, that it’s as strong as ever and getting stronger every year." Both Book of Lists and BASTARDS can be purchased from The Shop using Paypal, or contact me here for other methods of payment.